If you are a cricket fan, probably you would know the Cricinfo cricket website run by ESPN. It’s the number one cricket information web portal in the world with news and live commentary of on going matches. Another season of IPL is set to start Today. So you would be looking for match schedules and live cricket scores on your mobile. Cricinfo website has a WAP portal dedicated for live cricket scores. Mobicast is a software version of Cricinfo WAP portal with some more features. Mobicast works with almost all Java Supported mobile devices. On load, Cricinfo Mobicast will ask for the selection of your time zone. According to that it will set a personal home page matching your preferences. So if you select India, you will get personalized cricket content related to India. There will live commentary of on going cricket matches, schedule for upcoming matches and highlights of previous matches. Cricket videos, news and archive of stats is another plus point of the Cricinfo Mobile software. 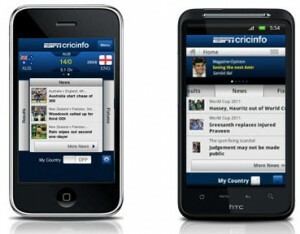 The iOS version of Cricinfo mobile will send push notification or alerts at various stages of a cricket match. Cricinfo Mobicast support IPL cricket matches too. Download ESPN Cricinfo mobile for Android here, iOS here. Other OS users, leave your mobile model here. We will direct you to the Cricinfo mobile versions compatible with your device.